All-Span Scaffolding is your local scaffold hire company. We offer a complete scaffold hire service using Kwikstage modular scaffold erected and dismantled by fully trained staff. 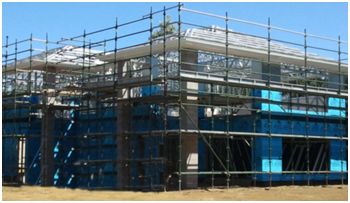 Our scaffolding services are recognized by builders and contractors as having a wealth of experience across residential, industrial and engineering sectors. 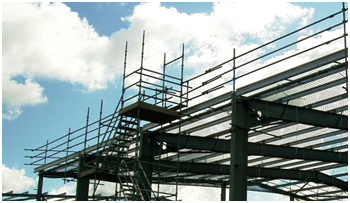 With our highly qualified team of scaffolders, we have the skill, knowledge and resources to undertake anything from the smallest domestic scaffolds, to large commercial projects. We provide a full range of scaffolding services including scaffolding, roof covers, support work, and stair towers, to all sectors from domestic properties to large construction sites. 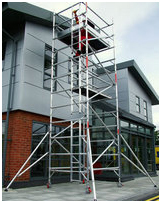 All-Span Scaffolding have a complete range of Steel Kwikstage scaffold for sale, painted or HDG. Safety when working at heights is not only common sense; it’s also a legal requirement. When you are installing a new roof or making repairs on your existing one, having quality and reliable safety measures in place is a must. 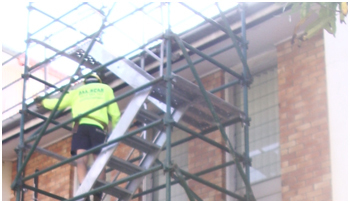 Safe access to the work area is required, whether it is to a level area, low or high pitched roofs, All-Span Scaffolding offers total worker safety. All our scaffolders are qualified to either basic, intermediate or advanced level and hold current tickets. Our workers are aware of current workplace health and safety regulations. At All-Span we use a number of different solutions we use including fixed and mobile aluminum towers.